When it’s pouring down with rain outside there’s a real sense of security in sitting indoors watching the water plummet down, safe in the knowledge you are warm & dry. Terriara, a 2D build-em-up, delivers on this sense of security and place; like it’s 3D cousin Minecraft, it ensures early days are spent gathering materials to build a sanctuary from the 'bad things' that come in the night. But where it differs from Minecraft, is in delivering a more goal-oriented experience. When Minecraft started making waves I knew to avoid it at all costs. In the same way that I won’t go near an MMO; I’m acutely aware how these things get under the skin and before you know it it’s 3AM and your family have left you. Those shelves you said you’d put-up in 1986 are still in the box – but the full size model of The Death Star (with working lifts) is fully operational in all its virtual glory. Luckily (depending on your perspective) Terraria offers a little more 'game' than Minecraft, in having quest monsters to kill – whilst there isn’t a narrative there is a sense of direction. Obviously some of these monsters are rock hard, requiring you to go-a-mining for the resources to craft the weapons necessary to cave their heads in (do you see what I did there?). Partly due to its gorgeous 2D aesthetic, Terraria isn’t quite overwhelming on day one – obviously you can do what you want, but the lack of a third dimension can focus the mind. 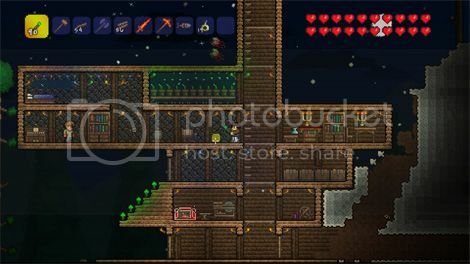 So, if you’ve tired of Minecraft or fancy dipping your toe into the genre, Terraria isn’t a bad place to start. It provides many enjoyable hours of fun creation and gameplay. It’s also worth mentioning that a Vita version is also on the way, which might offer perfect slices of creativity whilst on the go.